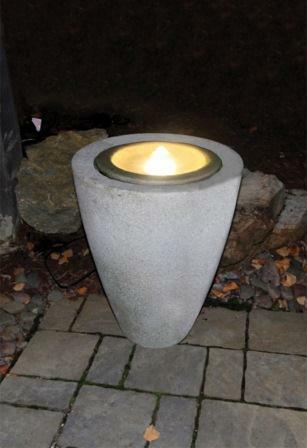 Add a new dimension to your decorative fountain with the Aquascape LED Fountain Accent Light. Add a new dimension to your decorative fountain with the Aquascape LED Fountain Accent Light. 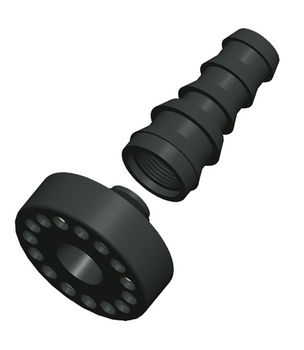 This compact, round-shaped fitting retrofits almost all Aquascape fountains. The unit allows water to pass through the center of the light making for a stunning display. If you currently own an Aquascape decorative fountain that came with a plastic waterspout, this new light is completely interchangeable and can be swapped out in a few minutes. For customers currently using Aquascape lighting, the LED Fountain Accent Light is also available without transformer to retrofit within your current 12 volt quick connect lighting system. LED Fountain Accent Lights fit, and are interchangeable with standard Aquascape decorative product connections. Use a Three Way Splitter (or two) to hook up to 6 lights together. Each light draws only ONE WATT of power!